Dower chest carved 1945 for Phyllis (Margaret) Hawker née Payne . Who was Nellie Payne? 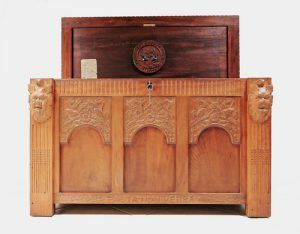 Dower chest for Phyllis Payne. 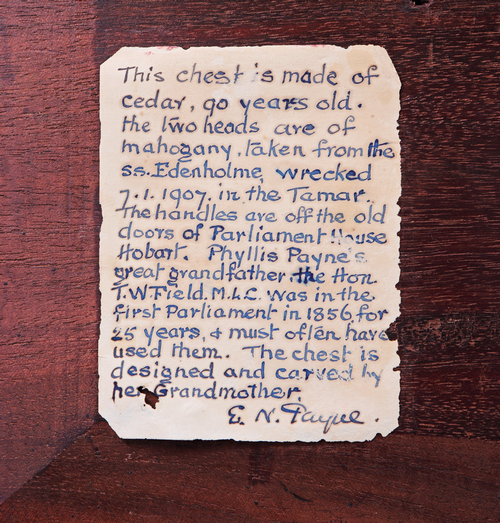 Provenance of Phyllis Payne dower chest. 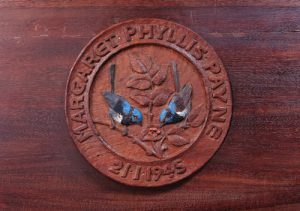 Fairy Wrens inside lid. Phyllis Payne’s dower chest. 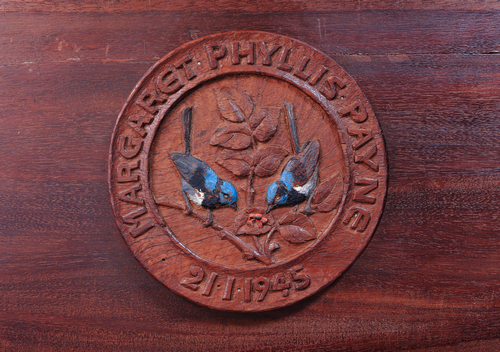 Phyllis is Nellie and Dr Payne’s second grandchild – the second daughter of Geoffrey and Gladys Payne. Phyllis was born in 1924 and trained as a nurse at the Royal Hospital in Hobart before going to England and St. Bartholomew’s Hospital. She enjoyed travelling and had many friends. Phyllis suffered a midlife aneurysm and was somewhat incapacitated after that although she never lost her generous spirit. She never married and therefore had no children, passing away in 1997 at the age of 73. Her dower chest is now with her nephew, Philip Davson in Switzerland. He has kindly sent us photos for this exhibition. Photographs of Phyllis’s dower chest sent from Philip Davson.